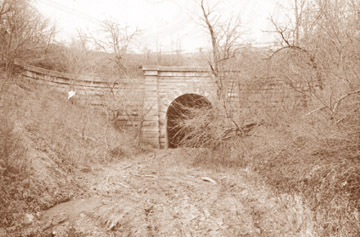 "The Blue Ghost Tunnel", also known as "The Merritton Tunnel" due to its proximity to Merritton (now a part of St. Catharines), was constructed in the mid - 1870's as a part of the 3rd Welland Canal. Also known as "The Great Western Railway Tunnel", it provided passage for the Great Western Railway under the 3rd canal just south of the old lock 18 which is located about 3/4 of a mile east of the "flight locks" of the present 4th canal. The Great Western Railway was absorbed by the Grand Trunk Railway in 1882 and the tunnel became known as "The Grand Trunk Railway Tunnel". The tunnel continued in use until around the time of the First World War when it was replaced by a swing bridge just south of the old lock 17. 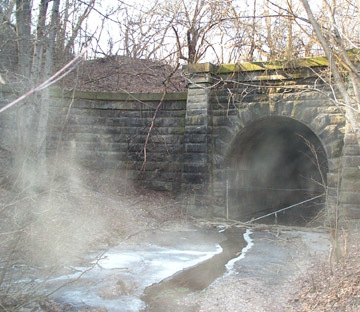 There was a train wreck adjacent to the tunnel in the early 20th century and the ghost(s) of the person(s) killed are alleged for some reason to have chosen to haunt the tunnel. 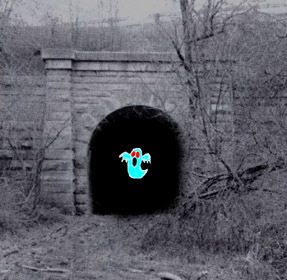 Images of wispy fog and mist are said to provide evidence of this haunting; and the tunnel became known as "The Blue Ghost Tunnel." 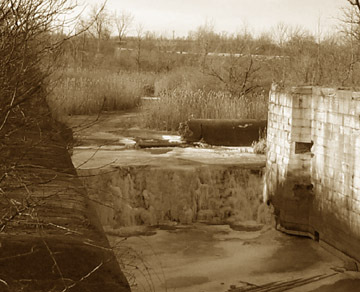 Large, dark abandoned structures such as this certainly have a spectral atmosphere about them. The Grand Trunk Railway was in turn absorbed by the Canadian National Railway system shortly after the First World War and the swing bridge (although it no longer swings) is still in regular use by the C.N.R. 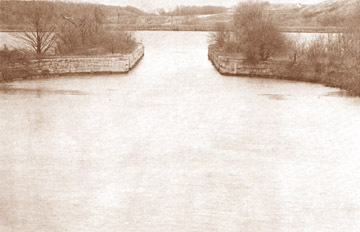 Another possible reason for "ghosts" in this area revolves around an old cemetery, most of which is now located under the water of the large pond immediately north of the Old Lakeview Cemetery as shown below. A Lutheran church was built in this area about 1773; and it was replaced with St. Peter's Anglican Church about 1832. St. Peter's gradually fell into disuse and in the 1920's it was decided to flood the area to make the present pond for the operation of the present 4th Welland Canal. However, there was a cemetery on the grounds. According Hamilton Paranormal, to only about 250 graves out of over 900 were moved to what is now the Old Lakeview Cemetery. The rest were flooded. The land on which the flooded cemetery was located had been deeded in the early 19th century to the original Lutheran church to be used as a cemetery in perpetuity. Apparently the remaining "residents" of the flooded cemetery took exception to having their graves flooded by the new pond and decided to haunt the area . . . or so the story goes. For the complete story, see the website of Hamilton Paranormal and scroll down a bit. In all fairness to those who decided not to move all the graves, remember that these were graves dating from "pioneer" times. The simple wooden coffins would have been in rough condition by the 1920's when the cemetery was flooded. However, there were tombstones left as well in the flooded area. At the very least, these stones should have been re-located and not left at the bottom of the pond. Some sources claim that all tombstones were re-located; while Hamilton Paranormal shows photos of tombstones in flooded area.
. . . .thanks to "Ajum The Great" at Urban Exploration Resource for mentioning this. 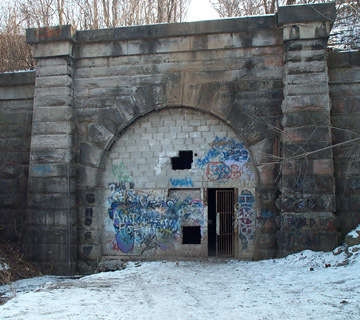 "Dating from the original canal works is one railroad tunnel under the former Lock 18 . . .. The tunnel is now abandoned for rail use, but its face and retaining walls are clearly intact at both ends. It is structurally complete, but leaks somewhat." "The entire area should be designated as a park." ". . . the inclusion of such features as the old railway tunnel in a trail, would create pathways of historic interest." 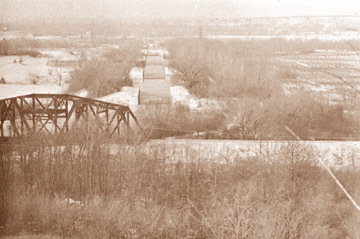 "Looking North Locks 12 to 16 Third Canal Truss Bridge in Foreground"
This is the "swing bridge" that no longer swings and was built to replace the tunnel. Note the Garden City Skyway spanning the present 4th canal in the distance. "Looking north-west from Lock 22 to Lock 21 Third Canal"
The old cemetery is thought to be somewhere under this pond, possibly in the foreground. 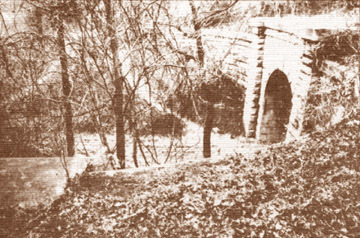 The Blue Ghost Tunnel is located under the stream and bull rushes above lock 18. In all fairness to those who claim the tunnel is unsafe, if part of it were for some reason to collapse, this water would rush into the tunnel. The Blue Ghost Tunnel would instantly become a decidedly unhealthy place to be at the time! It would be expensive to repair the Blue Ghost Tunnel properly; but local governments seem to have plenty of money when it comes to financing downtown (adults only) drinking parties such as the annual "Wine Festival" during which public intoxication is acceptable. 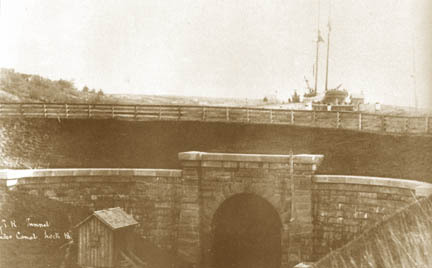 Note the sailing ship above the tunnel. The caption reads "G. T. R. Tunnel under Canal. Lock 18." The photo is from a manuscript plan entitled "1886 Dominion of Canada Department of Railways and Canals"
See the wispy mists? They appeared only in the photo and were not there before or after the photo was taken! This MUST be the ghosts of the tunnel! The authorities made a valiant effort at blocking up the west end of the Blue Ghost Tunnel. The jail-style door is made of heavy steel bars and the concrete blocks feature steel reinforcing rods. presumably by a blue ghost. a very eerie sort of place. for some real ghost images. Blue Ghost Tunnel at "Infiltration"
who no longer operate a web site.